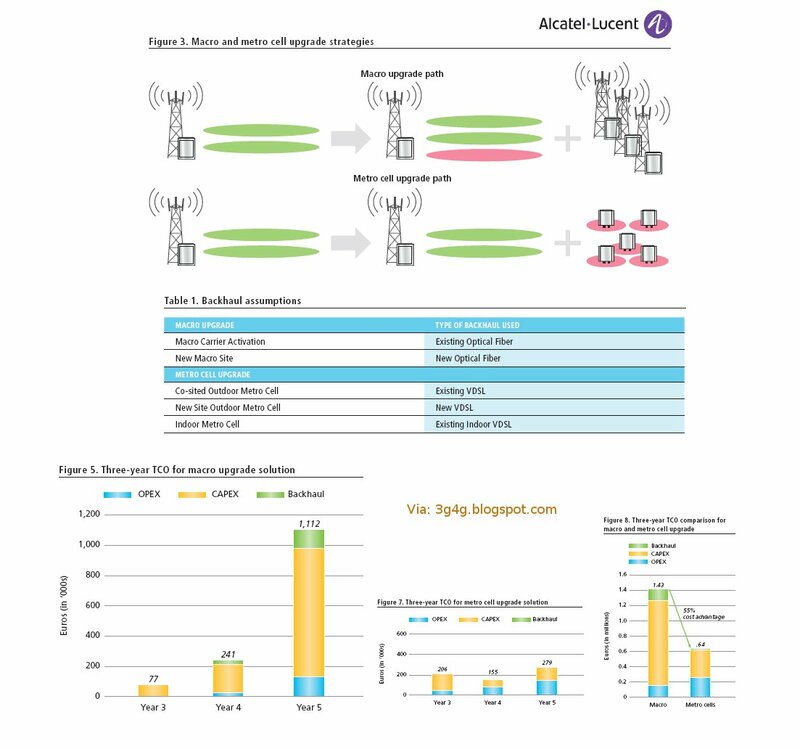 Just went through Alcatel-Lucent strategic paper on whether to go for more Macrocell sites or rather have Metrocells instead. Metro cells, the latest evolution in small cells, are based on the same low cost femtocell technology that has been successfully used in home and enterprise cells, but with enhanced capacity and coverage. With higher processing and transmit power, the first generation of metro cells is engineered to serve from 16 to 32 users and provide a coverage range from less than 100 meters in dense urban locations to several hundred meters in rural environments. However, unlike home and enterprise cells, metro cells are owned and managed by a MSP and typically used in public or open access areas to augment the capacity or coverage of a larger macro network. Available in both indoor and outdoor versions, metro cells are plug-and-play devices that use Self-Organizing Network (SON) technology to automate network configuration and optimization, significantly reducing network planning, deployment and maintenance costs. While indoor versions use an existing broadband connection to backhaul traffic to a core network, outdoor versions may be opportunistically deployed to take advantage of existing wireline or wireless sites and backhaul infrastructure, such as Fiber-to-the-Node (FTTN), Fiber-to-the-Home (FTTH), Very-high-speed Digital Subscriber Line (VDSL) street cabinets, and DSL backbone. Since metro cells use licensed spectrum and are part of the MSP’s larger mobility network, they provide the same trusted security and quality of service (QoS) as the macro network. With seamless handovers, users can roam from metro cells to the macro network and vice versa. Metro cells also deliver the same services as the macro network (for example, voice, Short Message Service (SMS), and multimedia services), and support application programming interfaces (APIs), that may be used for developing new, innovative services. In short, metro cells promise to be the ideal small cells for network offloading. We are conducting our first public training on UMTS and HSPA/HSPA+. 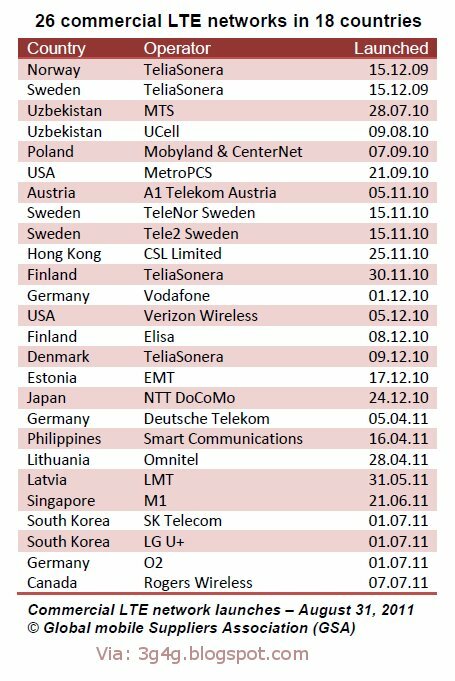 There are still a lot of people working on UMTS / HSPA / HSPA+ even though quite a lot of focus is being put on LTE. 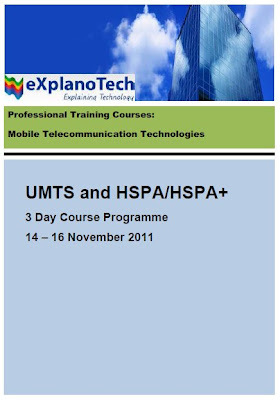 This course is split into 3 parts and the person attending it can decide which days he wants to attend. The intention is to bring a person with minimal knowledge upto a good speed and to a level where (s)he can become an expert by putting some extra effort. Discounts available for regular readers of this blog. Please ask. Panel Session on Small Cells (Femtocells) from Cambridge Wireless SIG event from Zahid Ghadialy on Vimeo. Chair: Mike Bowerman, Account Manager, Alcatel Lucent. We recently had our first 'Small Cells' SIG event in Cambridge Wireless entitled 'Small Cells: The beginning and where we are now'. The following presentation is the Introduction to Cambridge wireless and the 'Small Cells' SIG (special interest group). Embedded below are the slides and the videos that were taken by our host for the day, 'The IET'. The first presentation was by Prof. Will Stewart of The IET entitled 'Small Cells - Why small cells?'. Slides Available here. Video podcast here. Overall it was a good event. The main complaint was that people had lots of questions but didnt get to ask them. Hopefully they will ask them in the future events. Inter-band (e.g., 700 MHz, 1.9 GHz). Inter-technology (e.g., LTE on one channel, HSPA+ on another). This is currently a study item for Release 11. While theoretically promising, a considerable number of technical issues will have to be addressed. It is our understanding that some of the Cell_FACH enhancement proposals for Release 11 are targeted to make it more attractive to keep UEs longer in the Cell_FACH state than is expected with pre-Rel-11 devices. This expectation that the UEs may stay longer in the Cell_FACH state is in turn motivating the mobility from Cell_FACH state to LTE proposal. For instance, as the network can already today release the Cell_FACH UE’s RRC Connection with redirection, network may want to redirect UE to the correct RAT and frequency based on the UE measurement. Specifically if the network strategy is to keep the UEs long time in Cell_FACH state, it would make sense to provide the network the tools to manage the UEs’ mobility in that state. 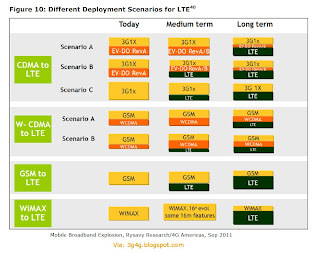 In addition, the needs for mobility to LTE are somewhat different from mobility to e.g. GERAN, as the former would be typically priority based while the latter would happen for coverage reasons. Thus, if introduced, the network controlled mobility from UMTS Cell_FACH would be specifically interesting for the UMTS to LTE case. Will update once I have more info. There are many different scenarios that operators will use to migrate from their current networks to future technologies such as LTE. Figure 10 presents various scenarios including operators who today are using CDMA2000, UMTS, GSM and WiMAX. For example, as shown in the first bar, a CMDA2000 operator in scenario A could defer LTE deployment to the longer term. In scenario B, in the medium term, the operator could deploy a combination of 1xRTT, EV-DO Rev A/B and LTE and, in the long term, could migrate EV-DO data traffic to LTE. 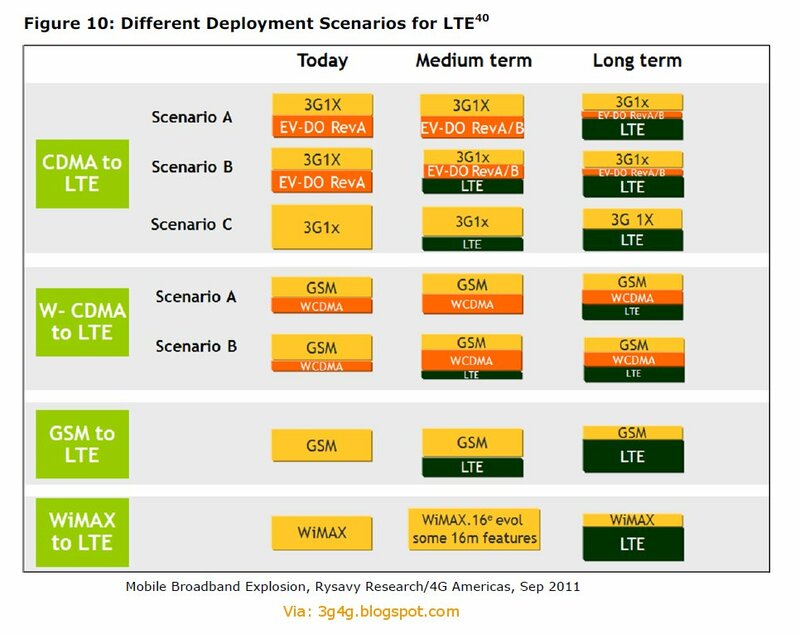 In scenario C, a CDMA2000 operator with just 1xRTT could introduce LTE as a broadband service and, in the long term, could migrate 1xRTT users to LTE including voice service. 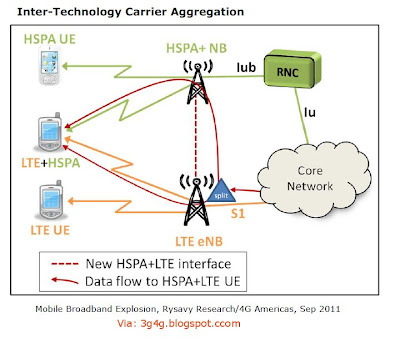 3GPP and 3GPP2 both have specified detailed migration options for current 3G systems (UMTS-HSPA and EV-DO) to LTE. Due to economies of scale for infrastructure and devices, 3GPP operators are likely to have a competitive cost advantage over Third Generation Partnership Project 2 (3GPP2) operators. One option for GSM operators that have not yet committed to UMTS, and do not have an immediate pressing need to do so, is to migrate directly from GSM/EDGE or Evolved EDGE to LTE with networks and devices supporting dual-mode GSM-EDGE/LTE operation. 4G Americas has published new whitepaper and presentation on Mobile Broadband explosion. A copy of these whitepaper, presentation and all other presentation on MBB is available on the 3G4G website here. Its been a while we talked about codecs. The traditional (narrowband) AMR (Adaptive Multi-Rate) codec operates on narrowband 200-3400 Hz signals at variable bit rates in the range of 4.75 to 12.2 kbps. It provides toll quality speech starting at 7.4 kbps, with near-toll quality and better robustness at lower rates and better reproduction of non-speech sounds at higher rates. The AMR-WB (Wideband) codec provides improved speech quality due to a wider speech bandwidth of 50–7000 Hz compared to narrowband speech coders which in general are optimized for POTS wireline quality of 300–3400 Hz. Couple of years back Orange was in news because they were the first to launch phones that support HD-Voice (AMR-WB). 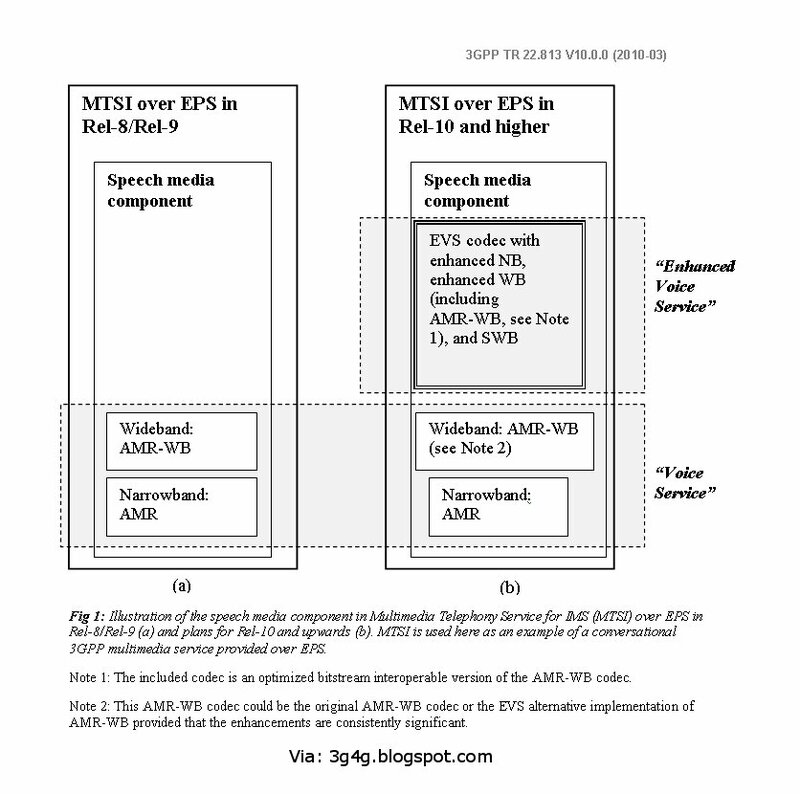 Extended Adaptive Multi-Rate – Wideband (AMR-WB+) is an audio codec that extends AMR-WB. It adds support for stereo signals and higher sampling rates. Another main improvement is the use of transform coding (transform coded excitation - TCX) additionally to ACELP. This greatly improves the generic audio coding. Automatic switching between transform coding and ACELP provides both good speech and audio quality with moderate bit rates. As AMR-WB operates at internal sampling rate 12.8 kHz, AMR-WB+ also supports various internal sampling frequencies ranges from 12.8 kHz to 38.4 kHz. AMR-WB uses 16 kHz sampling frequency with a resolution of 14 bits left justified in a 16-bit word. AMR-WB+ uses 16/24/32/48 kHz sampling frequencies with a resolution of 16 bits in a 16-bit word. Introduction of LTE (Long Term Evolution) brings enhanced quality for 3GPP multimedia services. The high throughput and low latency of LTE enable higher quality media coding than what is possible in UMTS. LTE-specific codecs have not yet been defined but work on them is ongoing in 3GPP. The LTE codecs are expected to improve the basic signal quality, but also to offer new capabilities such as extended audio bandwidth, stereo and multi-channels for voice and higher temporal and spatial resolutions for video. Due to the wide range of functionalities in media coding, LTE gives more flexibility for service provision to cope with heterogeneous terminal capabilities and transmission over heterogeneous network conditions. By adjusting the bit-rate, the computational complexity, and the spatial and temporal resolution of audio and video, transport and rendering can be optimised throughout the media path hence guaranteeing the best possible quality of service. A feasibility study on Enhanced Voice Service (EVS) for LTE has recently been finalised in 3GPP with the results given in Technical Report 22.813 ‘‘Study of Use Cases and Requirements for Enhanced Voice Codecs in the Evolved Packet System (EPS)”. EVS is intended to provide substantially enhanced voice quality for conversational use, i.e. telephony. Improved transmission efficiency and optimised behaviour in IP environments are further targets. EVS also has potential for quality enhancement for non-voice signals such as music. The EVS study, conducted jointly by 3GPP SA4 (Codec) and SA1 (Services) working groups, identifies recommendations for key characteristics of EVS (system and service requirements, and high level technical requirements on codecs). The study further proposes the development and standardization of a new EVS codec for LTE to be started. The codec is targeted to be developed by March 2011, in time for 3GPP Release 10. Fig. above illustrates the concept of EVS. The EVS codec will not replace the existing 3GPP narrowband and wideband codecs AMR and AMR-WB but will provide a complementing high quality codec via the introduction of higher audio bandwidths, in particular super wideband (SWB: 50–14,000 Hz). It will also support narrowband (NB: 200–3400 Hz) and wideband (WB: 50–7000 Hz) and may support fullband audio (FB: 20–20,000 Hz). Looks like Qualcomm is becoming my favourite company as the last few blog posts have been based on their documents and presentations. This one is a continuation of the last post on Multipoint HSPA. HSPA based mobile internet offerings are becoming very popular and data usage is increasing rapidly. Consequently, HSPA has begun to be deployed on more than one transmit antenna or more than one carrier. As an example, the single cell downlink MIMO (MIMO-Physical layer) feature was introduced in Release 7. This feature allowed a NodeB to transmit two transport blocks to a single UE from the same cell on a pair of transmit antennas thus improving data rates at high geometries and providing a beamforming advantage to the UE in low geometry conditions. Subsequently, in Release-8 and Release-9, the dual cell HSDPA (DC-HSDPA) and dual band DC-HSDPA features were introduced. Both these features allow the NodeB to serve one or more users by simultaneous operation of HSDPA on two different carrier frequencies in two geographically overlapping cells, thus improving the user experience across the entire cell coverage area. In Release 10 these concepts were extended so that simultaneous transmissions to a single UE could occur from four cells (4C-HSDPA). When a UE falls into the softer or soft handover coverage region of two cells on the same carrier frequency, it would be beneficial for the non-serving cell to be able to schedule packets to this UE and thereby improving this particular user’s experience, especially when the non-serving cell is partially loaded. MultiPoint HSDPA allows two cells to transmit packets to the same UE, providing improved user experience and system load balancing. MultiPoint HSDPA can operate on one or two frequencies. 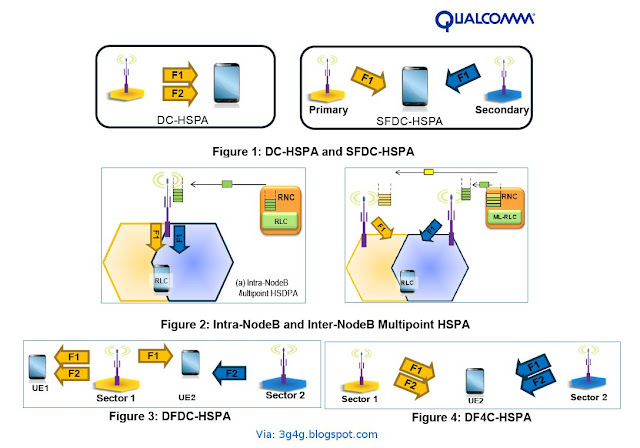 The simplest form of Multipoint HSPA, Single Frequency Dual Cell HSPA (SFDC-HSPA), can be seen as an extension to the existing DC-HSPA feature. 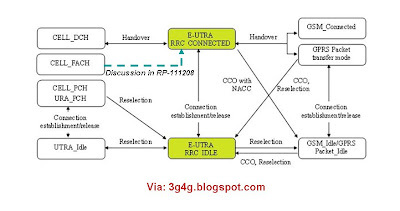 While DC-HSPA allows scheduling of two independent transport blocks to the mobile device (UE) from one sector on two frequency carriers, SFDC-HSPA allows scheduling of two independent transport blocks to the UE from two different sectors on the same carrier. In other words, it allows for a primary and a secondary serving cell to simultaneously send different data to the UE. Therefore, the major difference between SFDC-HSPA and DC-HSPA operation is that the secondary transport block is scheduled to the UE from a different sector on the same frequency as the primary transport block. 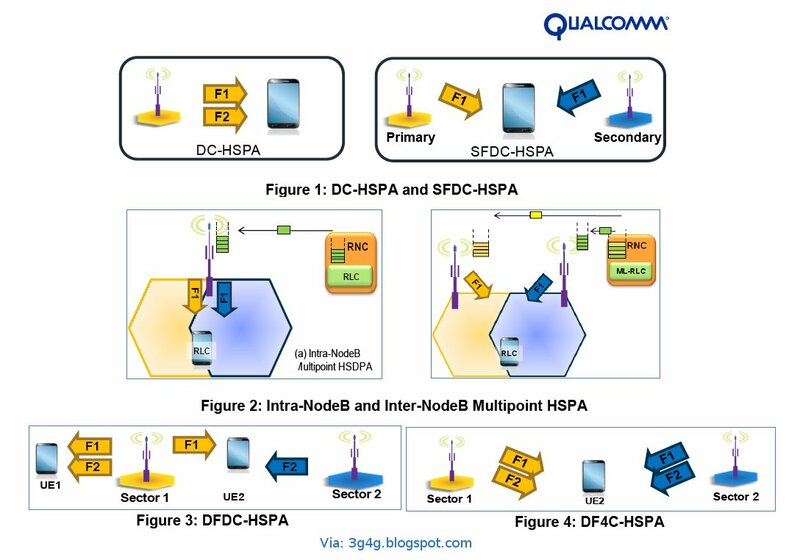 The UE also needs to have receive diversity (type 3i) to suppress interference from the other cell as it will receive data on the same frequecny from multiple serving cells.Figure 1 llustrates the high-level concept of SFDC-HSPA. In the case where the two sectors involved in Multipoint HSPA transmission belong to the same NodeB (Intra-NodeB mode), as illustrated in Figure 2, there is only one transmission queue maintained at the NodeB and the RNC. The queue management and RLC layer operation is essentially the same as for DC-HSPA. In the case where the two sectors belong to different NodeBs (Inter-NodeB mode), as illustrated in Figure 2, there is a separate transmission queue at each NodeB. 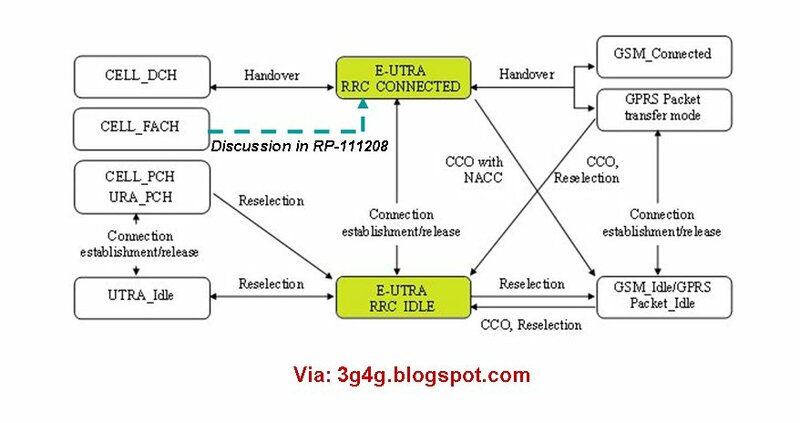 RLC layer enhancements are needed at the RNC along with enhanced flow control on the Iub interface between RNC and NodeB in order to support Multipoint HSPA operation across NodeBs. These enhancements are discussed in more detail in Section 4. In both modes, combined feedback information (CQI and HARQ-ACK/ NAK) needs to be sent on the uplink for both data streams received from the serving cells. On the uplink, the UE sends CQIs seen on all sectors using the legacy channel structure, with timing aligned to the primary serving cell. When two carriers are available in the network, there is an additional degree of freedom in the frequency domain. Dual Frequency Dual Cell HSPA (DFDC-HSPA) allows exploiting both frequency and spatial domains by scheduling two independent transport blocks to the UE from two different sectors on two different frequency carriers. For a DC-HSPA capable UE, this is equivalent to having independent serving cells on the two frequency carriers. In Figure 3, UE1 is in DC-HSPA mode, whereas UE2 is in DFDC-HSPA mode. Dual Frequency Four-Cell HSPA (DF4C-HSPA) can be seen as a natural extension of DFDC-HSPA, suitable for networks with UEs having four receiver chains. DF4C-HSPA allows use of the four receiver chains by scheduling four independent transport blocks to the UE from two different sectors on two different frequency carriers. DF4C-HSPA is illustrated in Figure 4. Like SFDC-HSPA; DFDC-HSPA and DF4C-HSPA can also be intra-NodeB or inter-NodeB, resulting in an impact on transmission queue management, Iub flow control and the RLC layer. Multipoint HSPA improves the performance of cell edge users and helps balance the load disparity across neighboring cells. It leverages advanced receiver technology already available in mobile devices compatible with Release 8 and beyond to achieve this. 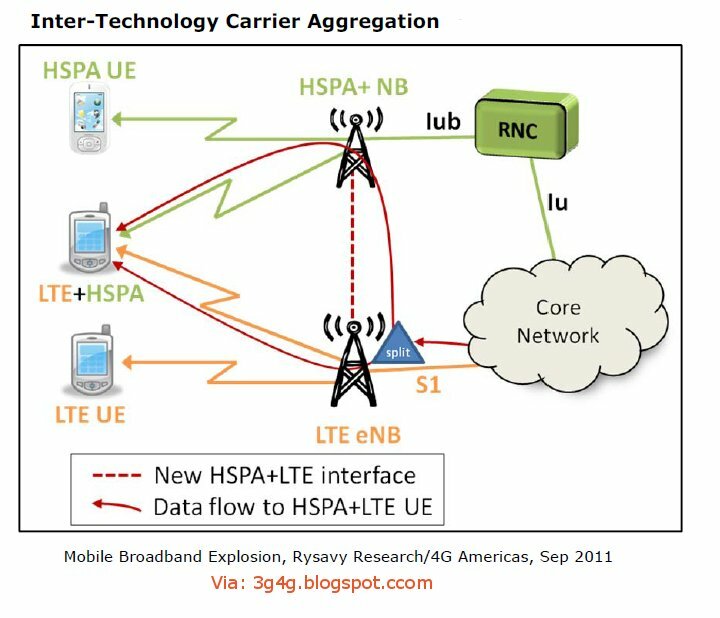 The system impact of Multipoint HSPA on the network side is primarily limited to software upgrades affecting the upper layers (RLC and RRC). Recently I read on twitter that Qualcomm has asked 3GPP to do a study on device to device communication. Sometime back I blogged about FlashLinQ, Qualcomm's proprietary P2P communication technology. I am not sure if Qualcomm is pushing for this one or wants to have a study in general. If you know more details please add as comments. And there is also this presentation which is less technical and explains the information in the video. More technically detailed presentation embedded in my earlier blog post here.